We are going to be talking around this subject for the next few weeks & try & pull a number of different threads together to make a whole cloth. Our common thread is the work of the Holy Spirit but I want to start with a quote about Kathryn Kuhlman. If you don't know Katheryn Kuhlman, she was an American Pentecostal evangelist who was a part of the healing ministries of the 40's & 70's, best known for the powerful healings that followed her ministry though she herself insisted: "I've never healed anyone... people are frequently healed en route to services, going home, and I'm not anywhere near." Video's of her ministry can still be found on~line & she is considered one of the most prominent healers of her time. However the quote is from this week's Charisma News & it highlights something very important & very scriptural. Keep in mind our end goal: And He was saying to them, "The harvest is plentiful, but the laborers are few; therefore beseech the Lord of the harvest to send out laborers into His harvest. Luke 10: 2 The command is to go & preach the gospel. [Mark 16:15] The promise is that these signs will follow...so why are we seeing so few signs? Why do some Christians deny that these things even take place? I believe Kathryn Kuhlman was on to something. Deep intimacy with the Spirit of Christ releases His supernatural power in our lives. Bill Johnson points out that all human action comes from either one of two basic emotions: fear or love. He makes the point that much of what is deemed *spiritual warfare* arises from fear. The devil is happy to have you chase him all over the place, any attention being better than none, in the name of Spiritual Warfare but this is not Jesus pattern. When Jesus dealt with the devil He dealt with Him. We have far more trouble dealing with the devil because we don't deal with him! We compromise. We leave doors open. We fail to establish ourselves in the Truth. We fail to put on our armour but where do we get our armour from? We get it from our source: Jesus Christ! All these things can disrupt our intimacy with Christ. We are told in John 15 that Christ is the vine & we are to remain in Him! For without him we can do nothing! It is very simple. We are not to chase the gifts, the signs & wonders, the manifestations of the Holy Spirit. We are to pursue God: heart, soul & mind then the gifts, the signs & wonders, the manifestations will follow! Still with me? I want to draw your attention to a principle established in Genesis & expounded on throughout scripture because so many of us suffer from the modern disease of *I want it & I want it now! * We have not learnt the art of patience, of being still & knowing that God is God. Here is our principle: Adam & Eve did not posses the entire earth even though they had been given authority & dominion over it. They only ruled that part of it that they could manage well. They started with the garden with a mandate for expansion. They were to grow into their inheritance ~ & so must we. We do not inherit everything @ once even though everything belongs to us in Christ Jesus. We are limited by how well we allow ourselves to be ruled by Christ's Spirit. You do not give rulership of a kingdom to a child even though he owns everything by right of inheritance. You wait till he matures, training him in how to govern well. As it is in the natural, so it is in the spiritual. We must grow in maturity. There are no shortcuts. Now I admit I like shortcuts. If I can see a way to make something quicker & easier I will take it! It does not always end well. When my mother taught me to sew I always omitted tacking my seams. So dull & unnecessary ~ & I got away with it so long as I was sewing cotton or flannel but the day I tried that on satin...oh. My. Never was there such a mess. The unpicking took forever. All my seams were a frayed mess. It took three times as long & much more trouble & exasperation than if I had just done it right the first time! So it is in the spiritual. You can get away with the short cuts only so far. When the real trouble arises you want to get it right & the only way to be sure of that is to have practised doing it right all the way along! You know, Jesus understands the allure of the shortcut. He came to seek & to save that which was lost [Luke 19:10]. 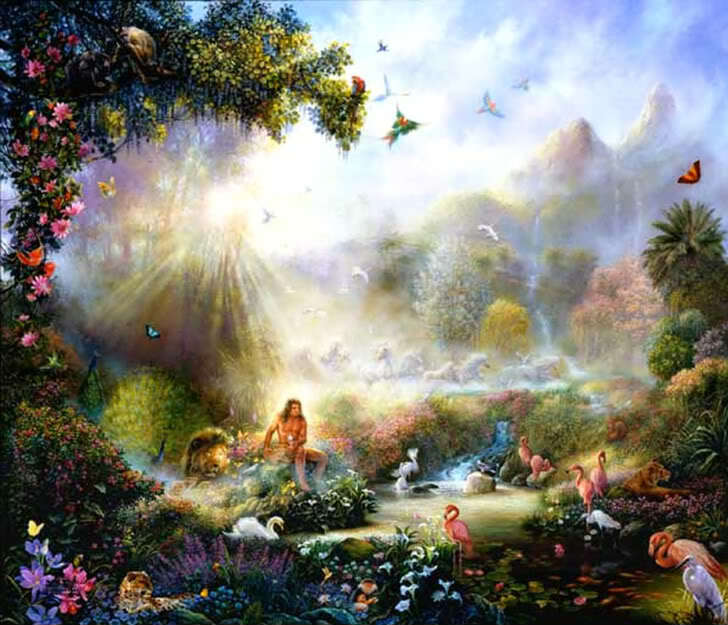 We were lost in the garden when we handed our God given authority to satan ~ & the whole of creation fell with us. Everything became subject to death & decay [Romans 8:21], not from choice, but because we were the guardians & we handed our authority over to satan whose desire is only to kill, steal & destroy [John 10:10]. So when satan came to Jesus in the desert satan knew why He had come. He knew what Jesus was going to take back ~ & you can bet your booties, after going to so much guile to obtain it in the first place, he did not want to give it back! So he makes an offer: he takes Jesus to a high place from whence He can see all the kingdoms of the world And the devil said to Him, "I will give You all this domain and its glory; for it has been handed over to me, and I give it to whomever I wish...[Luke 4:6] Shortcut! Notice there is no disputing over who owns the kingdoms of the world. Satan does. And he expressly states that it has been handed over to him. We know God gave the authority to Adam & Eve so the only possible way satan got that authority is from them! Aren't you pleased Jesus rejected the shortcut?! But Adam & Eve lost something much more important than their authority when they began listening to satan. They lost their intimacy with God. Dog~ Kelev= like a heart/loyal heart. It also seems that God had a habit of walking in His garden in the cool of the evening. Now if you've ever had kids you know that evening is the time for intimacy. When the day cools down & they are headed to bed, that's when they want to talk; ask the big questions; get held & loved on. It seems God & Adam & Eve had something of the same deal going on but the day they listened to satan was the day they hid from God. A deep sense of wrongness, guilt, shame & disaster overwhelmed them. God's perfect *tov* had been broken & they couldn't put it right! I imagine they were pretty panicked about that! Original sin did not begin with Adam & Eve. It began with satan & part of God's plan to bring satan to judgment was through establishing Adam & Eve in Eden & giving them the authority & power to rule. They were to co~labour with God to establish Heaven in Earth. It's right there in the first command. Multiply. Have Godly seed. Expand your borders. Once that intimacy was broken the co~labouring with God was also broken. The way back into intimacy with God is through the Holy Spirit & that has only been made possible through the shed blood of Jesus. The glory that covered Adam & Eve fell from them & they were naked. Embarrassing. So they covered themselves with fig leaves but in Genesis 3:21 we read The LORD God made garments of skin for Adam and his wife, and clothed them. The thing about garments made of skin is that they belonged to someone else first. In order to cloth Adam & Eve appropriately something had to die. One or more of the animals Adam had named & taken care of. You see this reflected again with the Paschal lamb. The lamb was brought into the tent & cared for by the family before being slaughtered. There is a cost to sin. Adam understood the cost when something had to die to cover his shame. The Israelite's were made to understand the cost of their freedom. The cost for our sin was the very son of God. He covers our nakedness. He removes our shame & guilt. His blood cries mercy. It was poured out for the remission of sins. It also provides a way to restore everything that has been lost through the fall. It brings us back into intimacy with God, for Jesus taught that we can approach God as Abba, father. That is all well & good but when we are born again we are not born fully fledged spiritual adults knowing all things. We are born as babes. ...like newborn babies, long for the pure milk of the word, so that by it you may grow in respect to salvation if you have tasted the kindness of the Lord. 1 Peter 2:2~3 And like babies we are meant to grow up spiritually for one day we will judge angels [1 Corinthians 6:3], we will rule with Christ [2 Timothy 2:12], become an heir with Christ [Romans 8:17] Paul is adamant: Brothers, stop thinking like children. In regard to evil be infants, but in your thinking be mature. [1 Corinthians 14:20] & Hebrews 5:13 Everyone who lives on milk is still an infant, inexperienced in the message of righteousness. Intimacy brings maturity. Just as a parent does not share the stresses of their job or financial worries with a child, nor will God share His deepest intimacies with those too immature to handle it. We need to grow up! It is not time deprivation that prevents us. It is not busyness. It is not weariness. It is laziness. Jesus was time deprived; He made time. He was busy ~ busier than you or I~ yet He made time. He grew weary ~ yet found His strength in the Father's presence. The harvest is ripe; the workers are few. We hold our Lord & saviour's blood cheaply because we have not taken the time to grow intimate with Him & hear from His heart how much it cost Him to save us from ourselves. Oh, we know intellectually, but until we know it deeply enough to allow it to change us then we remain as children: immature, thoughtless, selfish, ungrateful. I do not believe that is really true of anyone here so let us pursue God with all our might & strength for then we will see the glory of the Lord work miracles to bring in His harvest because the more I study scripture, the better I know our Lord, the more I am convinced that everything to do with our spiritual life boils down to just this one thing: How intimate we are with Jesus.